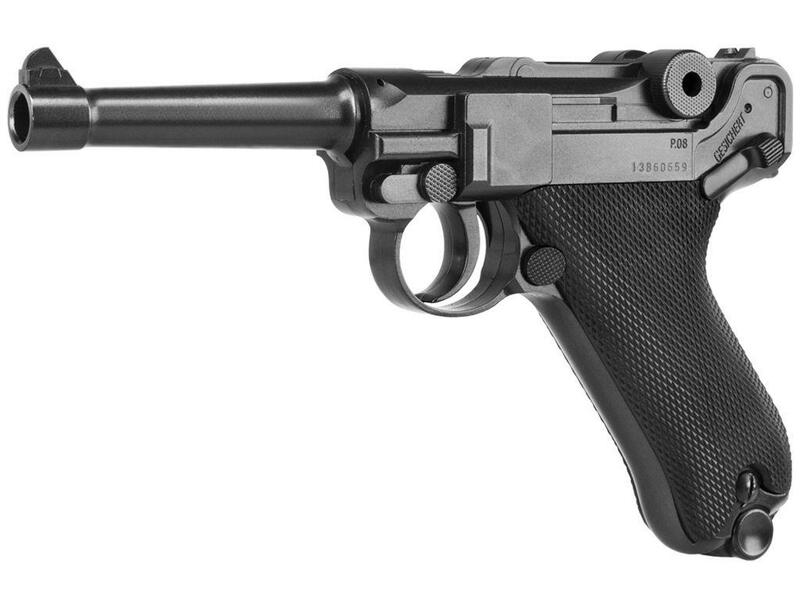 Umarex Legends Luger P08 .177 BB Pistol | ReplicaAirguns.ca | New Website! Trigger Pull: The trigger pull on the Umarex P08 CO2 BB Replica is rather heavy but since it is a double action only trigger, I did not expect it to be light. There is a fair amount of take up with the entire pull being about 9-10 pounds with the release point happening right at the very back almost touching the trigger well. The release is not very predictable when trying to shoot slowly but this does teach a firm yet relaxed grip to get consistent shots. This type of trigger I would consider to be a great double action training aid as it teaches proper grip and trigger control while building strength. Accuracy: I shot the Umarex P08 BB Pistol at a target from 20 feet away in a semi-rested position, and it performed very good getting a solid 1.5 inch 10 shot grouping that was very well centered on the target. The P08 almost got a 1 inch group with the acceptation of two flyers. The sights are non-adjustable so adjusting the Umarex P08 BB gun is not possible unless using a modified aim point! My initial Chrony testing puts this classic BB replica at right around 430 fps which was higher than the claimed 410, and keep in mind my test day was not a super-hot day so there is more room for higher fps with this air pistol. I managed to get six 21 round magazines worth of shots which is a very respectable 120+ shots per single CO2. 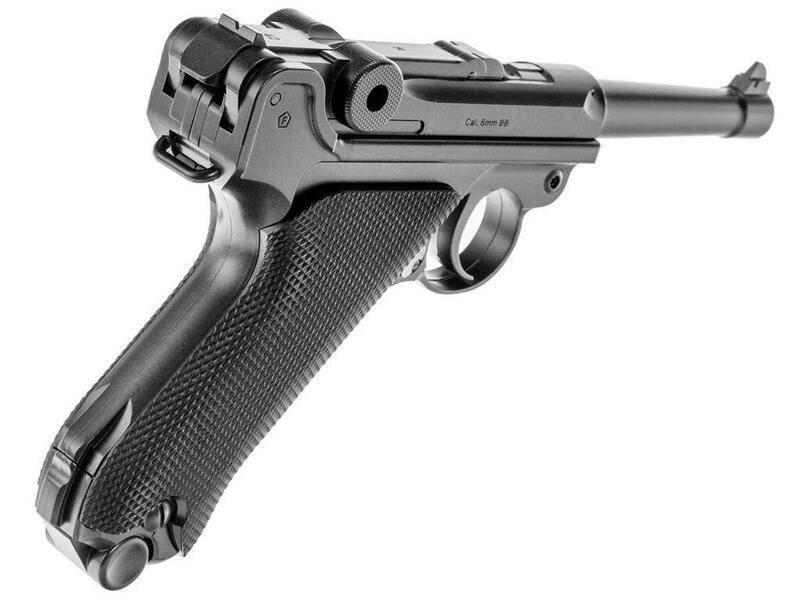 Build Quality: The Umarex P08 CO2 non-blowback BB Pistol is almost all metal with the exception of the grip which is always nice to see! I found the fit and finish to be very good with a black-grey-ish satin paint job . I did notice the paint was wearing off kind of quickly on the high points which I don't mind with this airgun since it will give it a more aged look that I feel is more fitting for this classic World War replica. 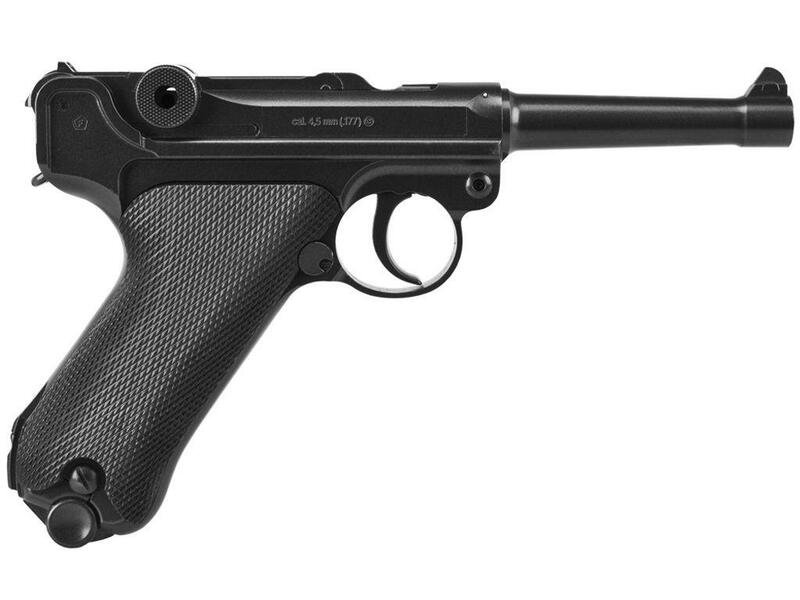 Realism: The Umarex Legends Luger P08 CO2 BB Airgun is very close to the real steel P08 (Luger) and even has the P.08 markings on it. If you where to put a real P08 side by side they would look like mirror images so in terms of looks, this replica gun has it. If you're looking for working parts there are not a lot other than the trigger, magazine release, and safety. But then again there is less to go wrong! There are not too many older Classic Airguns out there from the World War era so it was great to see this one added to the Umarex line-up. Now all we need is a Single Action Army Revolver ;) I am glad that Umarex made sure to make this gun look authentic, maybe even perhaps over functionality since there are not a lot of working parts. With that said, everything that does work, works well and you can expect to get lots of accurate and powerful shots from a single CO2. The fps consistency is really good on this one. Being that there are not many World War replica airguns on the market this is a must have for any collector of such guns. I had this pistol for about a year and fired it very seldom. I once had a real Luger and the feel is about the same. The accuracy is also very good. The problem is: it will no longer hold any gas. When I insert a new cartridge all of the gas escapes internally. That is why for quality I can give it only 1 star. Great value for your money. Got 6 magazines easy out of it with great accuracy. Has a solid feel and nice finish. this is my first BB-gun. i've owned my P08 for some months and have had fun shooting at various types of targets with really good accuracy at about 20 ft. the gun feels good in my hand and approximates the real thing that i once owned and fired. it doesn't have a blowback feature, which is preferable until the blowback ones are better manufactured for long-life. Great little pistol. Read Wonderbar review. It says it all and then some.Unlike the blowback model have had no problems what so ever.A working model from the past and enjoyable to shoot. Buy this while it's still on sale!! What a great pistol! The accuracy is crazy good. 1/2 inch groups or better at 15 feet, and 1 inch or under at 30 feet in standing double handed non rested position. A few drops of white model paint on the sights and this will be a perfect target pistol. It does have that long double action trigger, but once again it becomes predictable, so you can work around it and get very accurate shots going. The all metal gun feels great. I have fired off real Lugers when I was in the army. We had a few in our weapons vault and I got the honor of firing the standard Luger and the long barreled Artillery version with the shoulder stock. So I was very pleased to see the gun looks and feels about right. I wanted this gun in non blowback version too so I had a great well balanced higher FPS plinker. I will be buying the new blowback version too, but I am glad I got this one as well for the extra FPS that the gun will need for cans and paper out to 30 to 50 feet, and beyond. I am not going to say a negative thing about this gun. I can hack the plastic grips. I didn't want blowback...so this gun gets a 10 out of 10 from me. It is exactly what I wanted. I bought the Crossman Mark I and Mark II pistols in .177 and .22 cal when I was a kid. I bought them because they looked like a Luger and the Ruger Mark I, the Browning Buckmaster, and the Colt Trailsman .22 cal rim fire plinkers that were so popular back then. They still are popular today, and it's due to you can't change perfect. The 75 degree angled grip of a Luger or any of the guns that imitate that angle and style of grip, is the perfect grip for just about any human hand. This BB pistol points very naturally, just as the real one does. It's a true extension of the body. Buy this and expect to see some of your best shots on paper or cans, it's target quality accuracy, and it's a smoothbore BB gun. Go figure?? Mick from Ottawa. 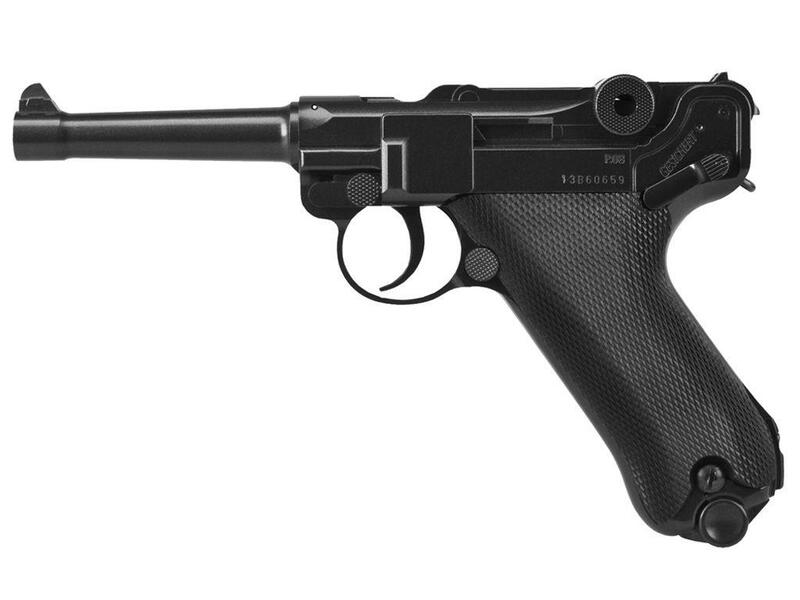 http://www.ReplicaAirguns.com - Umarex Legends P08 Luger CO2 BB Pistol Table Top Review. This video is a walkthrough review of the Umarex P08 (Luger) Non-blowback CO2 BB Gun Replica. I show off this airgun close up from all angles and point out the mostly metal construction and go through the features and benefits of this Classic BB pistol Replica. I also do a quick pre-test with my Chronograph to get an idea of the fps performance and then shoot the P08 BB pistol from 20 feet out on target for some accuracy results.